I don’t get that much. Actually, I never get that. I have to imagine they get really tired of people walking up and saying, “Dude, you make that look so easy!” – but at the same time, it is a testament to their mad skilz that they can take something that is so not easy and make it look approachable by, say, a wildly out-of-shape 40-something who has yet to take even one successful run on a pair of skis down the baby slope, which is a step down from the bunny slope favored by preschoolers everywhere. ANYWAY. Yeah. 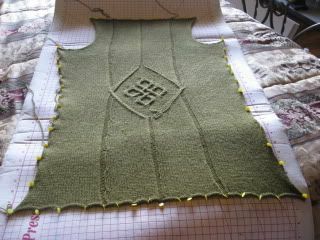 I’m really surprised at how fast I got from hem to shoulder on the back of this. Although it wasn’t really fast – it was a matter of having a lot more time than usual, thanks to strategic ignoring of household and parenting duties. Woooooooo, let’s hear it for shirking one’s responsibilities! BOO-YEAH! But then, this is the easy part of the course. A three day weekend, not a lot going on in the garden right now, most of the household chores under control (more or less) (OK, OK, mostly less), the cat mad at me because I got her nails trimmed Saturday morning (which means she does not want to be on my lap right now interfering with my knitting ability…she just wants to sulk around shooting me dirty looks and acting like I’m a cat murderer whenever I walk into the room…OHMYGAH, IT’S THE NAIL CLIPPING MONSTER FROM THE SWAMP LAGOON! RUUUUUUUUNNNNN!!!!! ), the Denizens miraculously interested in Other Things (I don’t expect that to last, but am enjoying a little break from the constant cycling of little people informing me that they are bored, boooooored, SO bored, BORED! BORED! BORED!, but of course they don’t want to do anything I might suggest as a remedy for their boooooooorrrrreeeeeeeed little selves)…I got some business taken care of this weekend! But I’ll be entering the long, hard slog part tomorrow. Tomorrow, I’m back to work. Back to the normal days where time is not my friend. Knitting in moving vehicles. Balancing what I need to get done for work with my knitting dreams. Fatigue is already setting in on the right elbow. And my left pinkie, which I jammed so hard a couple weeks ago that for a split second I thought I broke it – I didn’t, but I surely did do a number on it. The swelling is mostly gone but it still smarts, and it doesn’t like holding the needles too much. But, like any true athlete with devotion to their art (shut up), I soldier on through the pain, eyes on the prize and, uh, in it to win it and, erm, uh, well, yay, me! I think the 'making it look easy is the mark of an expert' doesn't apply as much to fine motor skills. Does a concert pianist make things look easy? Does a surgeon? Activities which require gross motor skills, like the ones you described, offer more of an opportunity to show gracefulness, which I think is what makes things look easy. With smaller movements, the gracefulness (or lack of it) just doesn't show as much. Wow. Look at you go! I'm not an official Olympic knitter but I started a new project on Superbowl Sunday (I don't care for the football but the knitting time is good) and, DOOD, it's growing like crazy because I'm glued to the TV (I just put it on Ravelry...Ondine if you wanna check it out). GO TEAM SHIRK! And moguls? They HURT. They make my teeth ache and my knees ache and, well, I avoid 'em. Those people are superstars.